No Fear of the Future: Painted by pygmies! 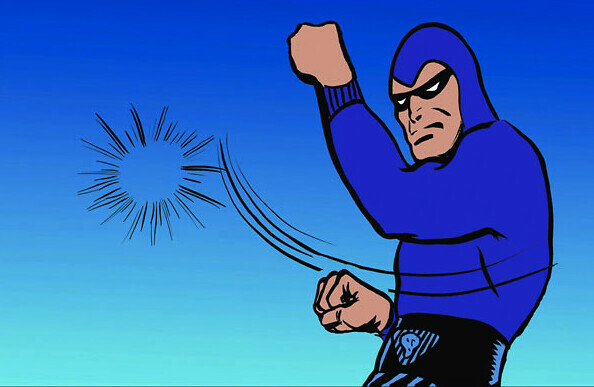 The Phantom is one of those wonderful anachronisms, a daily newspaper comic strip. A narrative that has been unfolding without end, and often without direction, since 1936 (and telling the latest iteration of a story supposed to have begun in 1536). Like all comic strips, The Phantom exists suspended in time, with the narrative playing out in a three-panel haiku that proceeds in accordance with the intrinsic temporal logic (or illogic) of the strip. One of the inevitabilities among the stalwart adventure and soap opera strips that still exist (such as Mark Trail, Judge Parker, Rex Morgan, Mary Worth, Prince Valiant, Flash Gordon, Mandrake) is that they are no longer written and drawn by the people who created them. It most cases, those creators are long dead, progenitors of narratives so much longer than anything else out there that they have almost a full century with their basic proto-pulp qualities intact. When they were created, the dailies and Sundays were such a big deal (in an age where every town of any size had several daily newspapers) that the best creators were glamorous figures who made small fortunes — people like Alex Raymond, Milt Caniff, Roy Crane, and Phantom and Mandrake creator Lee Falk. In part because many of the original strips were works for hire controlled by the syndicate, longstanding traditions exist in which the original creators train apprentices who do much of the work, and ultimately take over the strip. At the peak, many of them had full production teams — Roy Crane had a stylebook to enable his minions to properly render the Zip-a-Tone clouds of Buz Sawyer. The current Mandrake artist, Fred Fredericks, took over those duties from his boss in 1966. Imagine being a twentysomething illustrator who finds a gig in some forgotten suburb working as an assistant for one of these sclerotic cartoonists, subtly infiltrating the alternate universe of the strip with a bit of the contemporary Zeitgeist. As they struggle to survive, the two major remaining syndicates have begun doing the dailies in color and relying on the Web as an alternative distribution medium. This has enabled the dailies to all be in color. The problem is, the colorists do not usually appear to be the same people as those writing and drawing the strip. It is a frequent occurrence for characters to have the wrong hair color, and other amusing continuity busts for the AM radio No-Prize contingent. 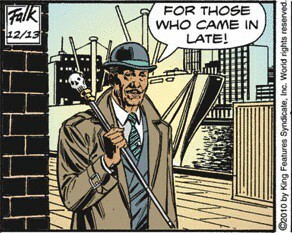 In The Phantom, the current auteurs have a practice of occasionally having the original creator, Lee Falk, appear in the strip as a metafictional narrator to provide the synopsis of the latest grapevine plot thread (Falk was always reported to be a bona fide dandy, with signature bowler and cane). Today was such a day, as Falk appeared on the docks of one of his fictional African countries, explaining how The Phantom has just rescued his wife Diana from prison, peaking an epic plot in which the terrorist Chatu (who the Phantom had saved from death by Ebola some years back) blows up an urban center, fakes Diana's death (abducting her just before the explosion), and has her imprisoned in evil Rhodia where her head is shaved by a vicious female warden, while the Phantom, believing her dead, roams the world fighting terrorists with nihilistic fervor in the company of a gorgeous Sikh privateer. It is no surprise that a "for those who came in late" update is needed, when the plot has been unfolding since sometime last year. The Phantom is more anachronistic than his fellow survivors, because his whole reality his trapped in Lee Falk's 1930s idea of a white man in Africa story—one who lives with a group of magical pygmies, and enforces the law of the jungle. So it is really wonderful when, through the tortured evolution of the strip, Falk ends up today depicted as a black man (one who looks a lot like Kid Creole). Which makes me wonder if one of the young apprentices has engineered a genius paradigm shift to maintain the strip's relevance in the 21st century -- one in which the racial coloring of all the characters are shifted, with a T'Challa-ready Phantom and his minions of pudgy white pygmies.